Glory Johnson and Brittney Griner during happier times. The couple is now engaged in a court battle to end their 28-day marriage. 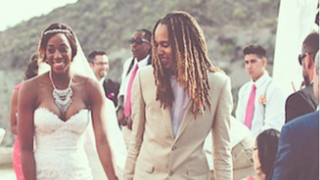 The love story between WNBA players Glory Johnson and Brittney Griner has involved a short-lived courtship, a domestic violence assault, a marriage, allegations of an undisclosed in vitro fertilization pregnancy, Griner's filing for an annulment and, now, Johnson's request for spousal support and attorney fees—all in less than a year. According to ESPN, Johnson wants "$20,000 per month in spousal support, plus a $10,000 advancement toward attorney fees" for her counsel. ESPN notes that Johnson filed papers with a Maricopa County, Ariz., court, and an evidentiary hearing is set for Aug. 17. According to the sports site, Griner, who plays for the Phoenix Mercury, and Johnson, who plays for the Tulsa Shock, were involved in a domestic dispute April 22 at their Arizona home. On May 8 they were married. On June 4 Johnson announced that she would be missing the entire WNBA season because she is pregnant. On June 5 Griner filed to get the marriage annulled, noting that the "marriage was based on fraud" and she "was unaware when the in vitro fertilization resulting in Johnson's pregnancy had taken place," ESPN reports. Griner's court petition also added that she shouldn't have to provide spousal support and that both parties should be responsible for their own legal fees, but that Griner would like to be compensated for her attorney fees should Johnson's court claims be found "unreasonable." Johnson countered, claiming that Griner was a willing participant in the IVF. She also said that because of the pregnancy, she has limited income potential because her earnings are dependent on her ability to play basketball, and as such, she needs financial assistance. Johnson added that because her pregnancy has been deemed "high-risk," she can't find alternative employment. ESPN reports that Johnson plans to return to basketball at some point, but until that time, she needs "household assistance, personal trainers and medical care not covered by her current insurance." Johnson is also asking that Griner keep up payments on the Mercedes she purchased for Johnson.